The cytotoxicity of propolis against tumor cells has been widely reported1. Propolis from tropical areas present components such as triterpenes, diterpenes and benzophenones2, however, new types of propolis may be recognized and their biological activities need to be elucidated. Therefore, four Colombian propolis samples were chemically characterized by gas chromatography-mass spectrometry (GC–MS) and their cytotoxic action against canine osteosarcoma (OSA) cells was determined, as well as apoptosis induction and changes in gene expression of CASPASE 8 and CASPASE 9. OSA cells were treated with ethanolic extracts of propolis; the lactate dehydrogenase (LDH) assay and the annexin V/propidium iodide kit were used to evaluate the cytotoxic effect and apoptosis induction, respectively. Changes in gene expression were evaluated by quantitative real time PCR (qPCR). The propolis samples were rich in diterpenes, triterpenes and benzophenones. Propolis samples induced a cytotoxic effect towards OSA cells that was correlated to the LDH leakage into the culture medium after cell membrane rupture. The cytotoxic effect increased in a time-concentration manner after incubation with propolis and the cytotoxic concentration 50% (CC50) was lower than 36.24 µg/ml after 72 h of treatment. Colombian propolis samples induced total apoptosis significantly (untreated cells: 10.77 ± 2.22%; treated cells: from 58.403% ±1.39 to 95.97 ± 2.14% after 48 h). All propolis samples increased the expression of CASPASE 8 and three of them induced the expression of CASPASE 9. Colombian propolis samples induced apoptosis in canine OSA cells, suggesting their promising potential as news strategies for cancer therapy. 1. Freires, I. A., de Alencar, S. M., & Rosalen, P. L. (2016). A pharmacological perspective on the use of Brazilian Red Propolis and its isolated compounds against human diseases. European Journal of Medicinal Chemistry, 110, 267-279. 2. Castro V, Negri G, Salatino A, Bandeir M, (2011). A new type of Brazilian propolis: prenylated benzophenones in propolis from Amazon and effects against cariogenic bacteria. Food Chemistry, 125, 966-972. ISNAD MORA, Dolly Patricia Pardo , MURILLO, Oscar Julián , BUITRAGO, Mauricio Rey , LOSADA, Mónica , URIBE, Jaime Fabian Cruz , SANTIAGO, Karina Basso , CONTI, Bruno José , SFORCIN, José Maurício . "Cytotoxic Activity of Four Propolis Colombian Samples Against Canine Osteosarcoma Cells". 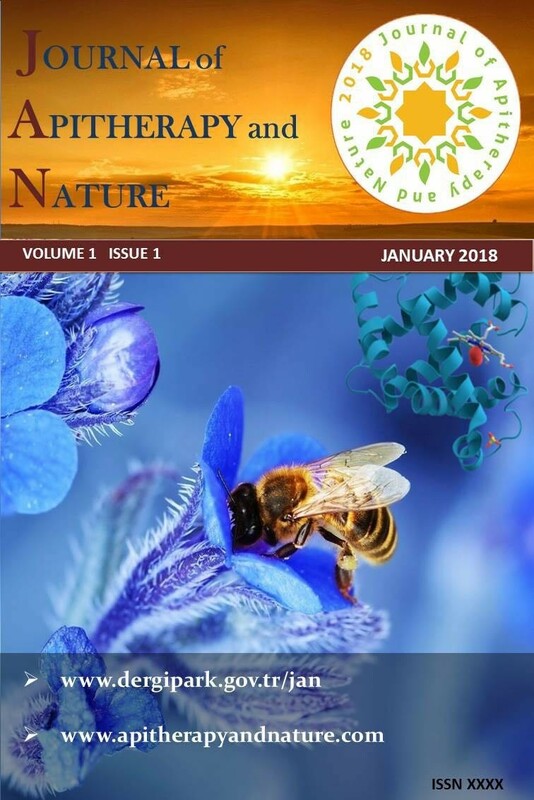 Journal of Apitherapy and Nature 1 / 3 (December 2018): 57-57.